Diversity within the profession is essential to finding a common and encompassing community vision. APA is committed to promoting more inclusive, just, and equitable communities through a planning profession as diverse as the communities we serve. 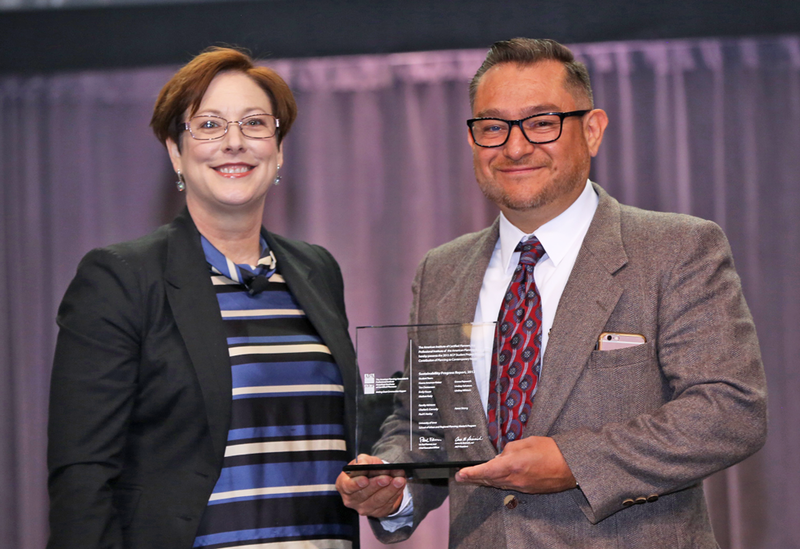 Miguel A. Vazquez, AICP, receiving the 2018 APA President’s Award from Cynthia Bowen, FAICP, to honor his work to advance diversity and inclusion initiatives. Photo by Riverview Photography. APA reached a milestone in April 2018 when the APA Board of Directors approved a Diversity and Inclusion strategy. This sets forth an association-wide plan for how we better promote the understanding and practices of diversity and inclusion, both within and outside the planning community and profession. This strategy is the result of years of conversation and dedication among our members and leaders, and APA thanks the many voices that paved the way for this organizational transformation and fostered the roots of meaningful change. Achieving a culture of diversity and inclusion is an evolutionary process that will require ongoing renewal of our commitment. It will take all of us to move forward in the right direction, and we encourage you to get involved and let your voices be heard. The plan should be considered a living document requiring regular reviews and updates to ensure it remains relevant to our goals. The goals in the strategy will be carried out on many fronts over time by various levels of leadership, component groups, and member volunteers, including a strategic assessment of partnership organizations that focus and advocate for historically marginalized groups to advance diversity and inclusion goals. This webpage will be updated regularly to describe how this will come to life. Volunteer as an APA Ambassador to educate and empower youth and communities about the power of planning and planners. Reach audiences of diverse backgrounds. Model activities are created for you. Partner with your chapter to speak at local universities or community colleges to promote our free APA student membership. Students enrolled in any degree are welcome and encouraged to belong. Volunteer on your local chapter diversity committee or take the lead in creating new programs and initiatives. Lend your voice to the development of a new Policy Guide on Social Equity and Inclusive Growth. Volunteer to help the APA Diversity Committee as it advances the strategies. Email getinvolved@planning.org to add your name and area of interest. APA Chapters and Divisions are actively committed to promoting diversity, inclusion, and equity within local communities and the broader planning field. APA Divisions connect you with other planning professionals who share your passions, challenges, and experiences. Although all APA divisions are committed to promoting diversity and equity within local communities as well as the field, four APA divisions and one interest group specifically focus on planning issues that concern special populations. Explore what Divisions have to offer (students can join up to five for free). Chapters get you involved in APA close to home. They're your local source for networking and professional development. You'll share experiences with colleagues and broaden your perspective beyond your commission or office. When you join APA, you automatically become a member of your local chapter. Visit your local chapter's website to learn more about its diversity efforts and to catch up on the latest planning information in your region. This session provides information on conducting meaningful engagement of minority and low-income communities in the planning process and discusses successful approaches and techniques to ensure equitable outcomes. Discover the barriers to integration of diversity in planning education and practice through recent studies that explore perceptions and personal experiences of diversity in the workplace, practice, and education. Learn strategies to foster diversity and promote culturally competent planning. This session showcases perspectives from a planner, interior designer/architect, and public-health professional on methods to increase diversity in planning processes and policy decisions. Creating equitable outcomes requires a commitment to applying different approaches to planning practice. Explore case studies and practical actions that everyday planners can take to plan for more equitable growth and development. Consider ethical responsibilities in reducing homophobia, transphobia, and heterosexism; learn to create safer, freer environments for all community members; and practice being mindful of sexual orientation, gender identity, and gender expression. Government’s proactive work on racial equity has the potential to leverage significant change. Explore planning tools and two case studies to help you achieve racial equity in our communities. Learn about the innovative practice of reorganizing government institutions to create more equitable outcomes, “Governing for Racial Equity” (GRE). Equitable development is sustainable development. Learn how to calibrate your place-based planning efforts to meet the needs of under-served communities more effectively and enhance other planning outcomes. Explore the groundswell of activity that is compelling communities to ensure everyone has a safe and healthy environment in which to live, work, and play. Social equity is the defining issue of our time. In light of today's political uncertainties and challenges we put together this three-part series to help planners foster broad-based, inclusive growth, and ensure they are creating more just and equitable communities. Take this course to learn more about how planners are making a difference. Moving toward more equitable communities is a priority for both planning and public health, but it can often feel like a daunting task. This session presents effective ways to incorporate equity into proposed projects or approaches and how you can leverage planning and public health data to strengthen your approach to equity. Legacy cities like Detroit, St. Louis, and New Orleans face challenges in providing services and infrastructure over vast areas that are sparsely populated and have limited resources. How can planners address issues of environmental justice and spatial equity in communities like these?